Lock in a great price for Holiday Inn Resort Krabi Ao Nang Beach – rated 8.5 by recent guests! Great location, lovely spacious family room. Breakfast options are great. We enjoyed every minute of our stay! The ambiance, the facilities and the location. Very fun hotel for kids. Pools are great and beds are very comfy. Especially liked the choice of firm or soft pillows. Breakfast was the best we have seen in Thailand. Great place for a family vacation. Very relaxing and kid friendly. Location of property is best as beach, local shops, market and restaurants are nearby within walking distance.. Pool view within the resort is awesome..
Service. Kids club. Massive swimming pool. By the beach and restaurants massage places but very quiet. The room was very cute, spacious and very clean! The pool was great, especially the pool bar during happy hour (50% off cocktails) shout-out to Bus and Su, both made fantastic drinks! Mini fridge was fully stocked and water was replaced daily! Holiday Inn Resort Krabi Ao Nang Beach This rating is a reflection of how the property compares to the industry standard when it comes to price, facilities and services available. It's based on a self-evaluation by the property. Use this rating to help choose your stay! One of our top picks in Ao Nang Beach.Located on the coast of Thailand, Holiday Inn Resort Krabi Aonang Beach is a spectacular boutique resort located on the white sands of Ao Nang Beach. It has rooms which open up to a large freeform pool. 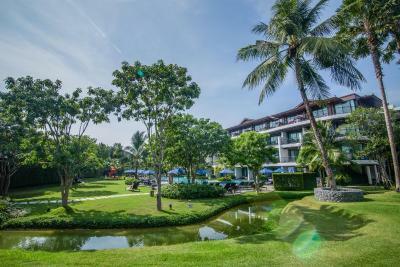 Set amid breathtaking tropical landscaped grounds, Holiday Inn Resort Krabi offers luxurious rooms with private terraces. Rooms are also fitted with a DVD player, elegant bathroom and WiFi access. Enjoy a peaceful day at sea by renting a yacht or cool off with a swim in the swimming pool. Guests can also recharge with a work-out in the fitness center or head to the spa. The hotel has has kids and teen zones. InnAsia, the hotel’s rooftop restaurant, serves fresh seafood and authentic Thai cuisine. A selection of refreshing beverages and spectacular beach views are enjoyed at the Wave Bar. 뀐 Located in the top-rated area in Ao Nang Beach, this property has an excellent location score of 8.6! When would you like to stay at Holiday Inn Resort Krabi Ao Nang Beach? Room has a sitting area, a flat-screen cable TV and a private bathroom. This room features direct access to the swimming pool. This twin room has a balcony, DVD player and air conditioning. This quadruple room features a balcony, tile/marble floor and bathrobe. This suite has a balcony, seating area and mini-bar. This double room has a balcony, CD player and tile/marble floor. House Rules Holiday Inn Resort Krabi Ao Nang Beach takes special requests – add in the next step! Holiday Inn Resort Krabi Ao Nang Beach accepts these cards and reserves the right to temporarily hold an amount prior to arrival. Please note that a compulsory Gala Dinner is included in the room rates of 31 December 2019. The rates of the Gala Dinner are based on room type and occupancy (guests sleeping in extra beds will be charged separately). The staff at the restaurant always looked miserable and were bordering on rude. Clean and very well kept. The location of the property was good. The live singing in the evening was a welcome change. But poor room service and so much of inconvenience made our stay a nightmare. Teeny bit dated, could probably do with an overhaul, but this doesn’t impact in any way on a fantastic experience. Delicious breakfast, so much choice! In fact all the food was lovely. Beautifully clean rooms and pool. Staff were all so friendly and helpful, had a wonderful time at this resort! Pool was really good for younger children. The location is far away from good restaurant. The food and kid facilities are great. Checkout experience was quite poor. Staff at the reception was unreasonably rude and unapologetic. They were quite dismissive of my genuine concern. The rest of the staff were quite friendly and welcoming. Just sharing this in case the hotel genuinely cares about improving the overall customer experience for the future. The kid suite we stayed in was quite dimly lit. The Holiday Inn Resort was a lovely place to stay, we really enjoyed our time there. The staff were fantastic, very friendly and helpful. The pools were great, our children loved the slides. The food was very good, there was a great breakfast selection. The hotel provided lots of entertainment from thai boxing lessons, yoga sessions to nighlty live music. The kid suite was great for us as a family of four. There was enough room and the bathroom was very large. There was a nice balcony too. Our first room was the car park end and the noise from the main road kept us awake but with no fuss, the manager moved us and sent fruit as an apology which given it was not the hotels fault was a nice thing to do. Great location and the staff were very helpful. Food night market 5 mins walk which was excellent.